Start by collecting all the images needed to install Rancher in an air gap environment. You’ll collect images from your chosen Rancher release, RKE, and (if you’re using a self-signed TLS certificate) Cert-Manager. 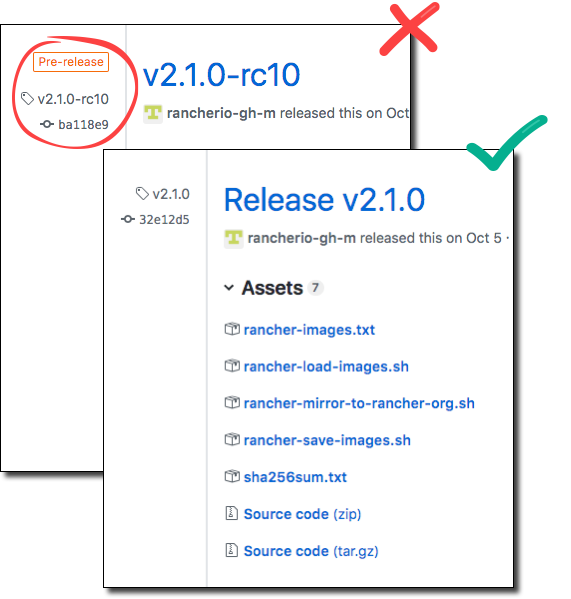 Using a computer with internet access, browse to our releases page and find the Rancher v2.1.x release that you want to install. Don’t download releases marked rc or Pre-release, as they are not stable for production environments. rancher-images.txt This file contains a list of all files needed to install Rancher. rancher-save-images.sh This script pulls all the images in the rancher-images.txt from Docker Hub and saves all of the images as rancher-images.tar.gz. rancher-load-images.sh This script loads images from the rancher-images.tar.gz file and pushes them to your private registry. From the directory that contains the RKE binary, add RKE’s images to rancher-images.txt, which is a list of all the files needed to install Rancher. Default Rancher Generated Self-Signed Certificate Users Only: If you elect to use the Rancher default self-signed TLS certificates, you must add the cert-manager image to rancher-images.txt as well. You may skip to B. Publish Images if you are using you using your own certificates. Fetch the latest cert-manager Helm chart and parse the template for image details. Sort and unique the images list to remove any overlap between the sources. Run rancher-save-images.sh with the rancher-images.txt image list to create a tarball of all the required images. Step Result: Docker begins pulling the images used for an air gap install. Be patient. This process takes a few minutes. When the process completes, your current directory will output a tarball named rancher-images.tar.gz. Check that the output is in the directory. Using a computer with access to the internet and your private registry, move the images from rancher-images.txt to your private registry using the image scripts. Note: Image publication may require up to 20GB of empty disk space. Log into your private registry if required. Use rancher-load-images.sh to extract, tag and push rancher-images.txt and rancher-images.tar.gz to your private registry.